A 48-year-old man was referred to our stomatology department by a general dental practitioner for evaluation of a painless soft tissue mass. The approximately 3 cm × 2?cm lesion had increased rapidly in size since the patient first noticed it a month earlier. Examination revealed a semifirm, slightly tender swelling involving the left maxillary alveolus and extending to the buccal vestibule between teeth 23 and 26 (left canine to left first molar; Fig.?1). The mucosa overlying the swelling was erythematous. The initial panoramic radiograph (Fig. ?2) showed a diffuse radiolucent area in the alveolar process of the left maxilla compatible with mild alveolar bone destruction; poor definition in the floor of the maxillary sinus; loss of the lamina dura; and lowering of the alveolar bone margin to a state resembling periodontitis or periodontal abscesses. Figure 1: Swelling in the buccal vestibule of the left maxillary region, with erythematous mucosa overlying the swelling. 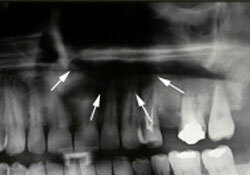 Figure 2: Panoramic radiograph revealing an irregular radiolucent pattern in the left maxilla (arrows). The clinical and radiographic findings suggested an aggressive lesion, and this diagnosis was strengthened by the absence of dental disease that could account for the radiolucency within the alveolar process. Furthermore, the widening of the periodontal ligament space in the region of the lesion in the absence of dental disease suggested an etiology not related to the tooth. Consequently, neoplasm was ranked high in the differential diagnosis. Inflammation of dental origin, chronic sinus infection or a mucous retention pseudocyst were considered to be less likely. Routine blood tests and biochemical examinations were normal, liver and kidney function tests showed no abnormalities and a test for HIV was negative. No lymph nodes were palpable in the facial region, and the patient did not mention any recent sudden weight loss. An excisional biopsy of the lesion was performed and the specimen was submitted for histologic and immunohistochemical examination. Sections stained with hematoxylin and eosin revealed connective tissue and striated muscle fibres infiltrated with follicular formations of various sizes and a mixed neoplastic lymphoid composition consisting of predominantly small cleaved cells (centrocytes) admixed with a few non-cleaved large cells (centroblasts). Immunohistochemical investigation demonstrated cells that were strongly positive for CD79a and CD20 and negative for CD5, CD43 and CD23 markers. The proliferation index with Ki-67 immunohistochemistry using the MIB-1 monoclonal antibody was approximately 60%. These features were consistent with follicular centre-cell non-Hodgkin lymphoma (NHL). The differential diagnosis of NHL in the oral cavity also includes odontogenic inflammatory process, periodontal disease, malignancies of the oral soft tissue, tumours of the jaws, neoplasms of the minor salivary glands and benign lymphoproliferative diseases, such as follicular lymphoid hyperplasia of the palate.5 Radiographic findings are not specific; they commonly reveal diffuse bone destruction, loss of the lamina dura or lowering of the alveolar bone margin resembling periodontitis or periodontal abscesses. Lymph node and tissue biopsy is the gold standard for NHL diagnosis. Indications for lymph node biopsy include significant enlargement, persistence of swelling for more than 4–6 weeks or a progressive increase in size.7 Although fine-needle aspiration is less invasive, confirmation by tissue biopsy is necessary in most cases.8 Early diagnosis of primary extranodal NHL of the oral cavity is based on histologic examination. Routine hematoxylin- and eosin-stained tissue sections together with immunohistochemical techniques should always be used. Immunohistochemistry using paraffin-embedded sections is a valuable technique in both diagnostic and investigative pathology as it best combines immunoreactivity and tissue morphology. Diagnosis in the early stages of NHL when there is minimal lymph node involvement is associated with better prospects for long-term disease-free survival. The prognosis is poorer for advanced stages of the disease with widespread involvement of the lymph nodes and extranodal sites. Highly aggressive lymphoma is mainly treated with multi-agent chemotherapy. Disease relapse is treated with supralethal doses of chemotherapy sometimes in combination with radiotherapy, followed by autologous stem-cell rescue. Our patient underwent 6 cycles of chemotherapy following the R-CHOP regimen. After these sessions, the patient returned to our clinic, where we observed significant remission of the oral lesion. This case emphasizes the importance of recognizing unusual pathology within the oral cavity, early diagnosis and prompt referral for subsequent management. Dr. Rullo is associate professor of oral and maxillofacial surgery, stomatology department, Second University of Naples, Naples, Italy. Dr. Addabbo is a resident of oral and maxillofacial surgery, stomatology department, Second University of Naples, Naples, Italy. Dr. Festa is a resident of oral and maxillofacial surgery, stomatology department, Second University of Naples, Naples, Italy. Lu P. Staging and classification of lymphoma. Semin Nucl Med. 2005;35(3):160-4. Epstein JB, Epstein JD, Le ND, Gorsky M. Characteristics of oral and paraoral malignant lymphoma: a population-based review of 361 cases. Oral Surg Oral Med Oral Pathol Oral Radiol Endod. 2001;92(5):519-25. Lin AY, Tucker MA. Epidemiology of Hodgkin's disease and non-Hodgkin's lymphoma. In: Canellos GP, Lister TA, Sklar JL, editors. The lymphomas. Philadelphia: Saunders; 1998. p.?43-60. Kemp S, Gallagher G, Kabani S, Noonan V, O'Hara C. Oral non-Hodgkin's lymphoma: review of the literature and World Health Organization classification with reference to 40 cases. Oral Surg Oral Med Oral Pathol Oral Radiol Endod. 2008;105(2):194-201. Epub 2007 Jun?29. Raut A, Huryn J, Pollack A, Zlotolow I. Unusual gingival presentation of post-transplantation lymphoproliferative disorder: a case report and review of the literature. Oral Surg Oral Med Oral Pathol Oral Radiol Endod. 2000;90(4):436-41. Ezzat AA, Ibrahim EM, El Weshi AN, Khafaga YM, AlJurf M, Martin JM, et al. Localized non-Hodgkin's lymphoma of Waldeyer's ring: clinical features, management, and prognosis of 130 adult patients. Head Neck. 2001;23(7):547-58. Pangalis GA, Vassilakopoulos TP, Boussiotis VA, Fessas P. Clinical approach to lymphadenopathy. Semin Oncol. 1993;20(6):570-82. Hehn ST, Grogan TM, Miller TP. Utility of fine-needle aspiration as a diagnostic technique in lymphoma. J?Clin Oncol. 2004;22(15):3046-52. Peterson BA, Petroni GR, Frizzera G, Barcos M, Bloomfield CD, Nissen NI, et al. Prolonged single-agent versus combination chemotherapy in indolent follicular lymphomas: a study of the cancer and leukemia group B. J?Clin Oncol. 2003;21(1):5-15.
van Oers MH, Klasa R, Marcus RE, Wolf M, Kimby E, Gascoyne RD, et al. Rituximab maintenance improves clinical outcome of relapsed/resistant follicular non-Hodgkin lymphoma in patients both with and without rituximab during induction: results of a prospective randomized phase 3 intergroup trial. Blood. 2006;108(10):3295-301. Epub 2006 Jul?27.